As Belfast prepared to commemorate the hundredth anniversary of the sinking of the Titanic, the iceberg (the great ship’s nemesis) provided an apt symbol for Northern Ireland’s continuing peace process. Above the surface is the public face of the peace, but what of the great mass of untold and often problematic stories hidden beneath the official version? 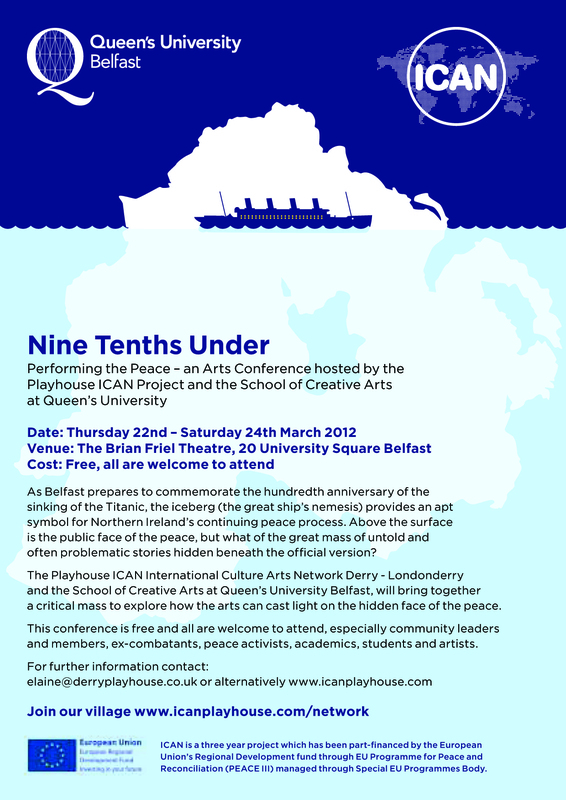 For ‘Nine Tenths Under’, The Playhouse ICAN International Culture Arts Network Derry- Londonderry and the School of Creative Arts at Queen’s University, Belfast brought together creative artists, academics, students and a range of different communities across the city to explore how the arts can cast light on the hidden face of the peace, not just in Northern Ireland but other societies emerging from a history of conflict, including South Africa and the Balkans. Events included specially devised performances, talks, seminars and round-table discussions. All events will be free and all are welcome to attend, especially community leaders and members, ex-combatants, students and artists of all kinds. The arts and peace-building conference, which gained international press coverage from the news network CNN, as Maloney discussed Boston College’s ‘Belfast Project’ oral history interviews. The Belfast/Boston project caused major political controversy following an extensive legal battle with the US government, as they attempt to force the handover of interview materials with interviewees. The award-winning journalist was just one of several highly esteemed panelists from around the world participating in the conference. Ed Maloney spoke at a special panel chaired by filmmaker Declan Keeney, including University of Ulster’s Cahal McLaughlin of The Prison Memory Archive, filmmaker Alison Millar, and Claire Hackett, from the Healing Through Remembering project and Falls Community Council’s oral history archive, Dúchas. The conference screened ‘The Far Side of Revenge’, a groundbreaking film documenting producer and director Margo Harkin’s engagement with Teya Sepinuck’s Theatre of Witness project. Other esteemed contributors to the conference include playwrights Dave Duggan and Owen McCafferty, Jane Taylor of the University of Chicago and University of The Western Cape, and multidisciplinary visual performance artist and puppeteer Aja Marneweck. The conference ignited conversations around how the Arts can benefit post conflict societies. It was great to see people exchange ideas, talk about new methods applicable to local and international issues.